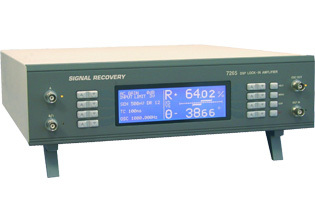 The SIGNAL RECOVERY model 7265 uses digital signal processing (DSP) technology to extend the operating capabilities of the lock-in amplifier to provide the researcher with a very versatile unit suitable both for measurement and control of experiments. Operating over a frequency range of 1 mHz to 250 kHz, the model 7265 offers full-scale voltage sensitivities down to 2 nV and current sensitivities to 2 fA. The instrument has a choice of operating modes, signal recovery or vector voltmeter, for optimum measurement accuracy under different conditions, and the use of DSP techniques ensures exceptional performance. The 7265 is capable of measuring the in-phase and quadrature components, vector magnitude, phase angle and noise of the input signal. This built-in experiment allows the internal oscillator frequency to be swept between preset frequencies, while simultaneously measuring the input signal magnitude and phase. The mode is ideal for determining the frequency and phase response of external networks. Most lock-in amplifiers will measure signals at the applied reference frequency or its second harmonic. In the 7265, operation is possible at harmonics up the 65,536th, and in Dual Harmonic mode, simultaneous measurements can be made on two harmonics. Dual-phase DSP lock-in amplifier operating over a reference frequency range of 0.001 Hz to 250 kHz. Wide range of extended measuring modes and auxiliary inputs and outputs. X, Y, R, ø, Noise, Ratio, Log Ratio and User Equations 1 & 2. 32k x 16-bit data points, may be organized as 1x32k, 2x16k, 3x10.6k, 4x8k, etc.